Monday, Nov. 5, 2018, 6:30 – 7:30 p.m. Fast-growing urban areas negatively affect the health of people, wildlife, and plants. Unlivable conditions lead to urban sprawl and expansion into undeveloped land. The presentation will discuss the application of public health metrics to design creative green spaces with health benefits for humans and wildlife. 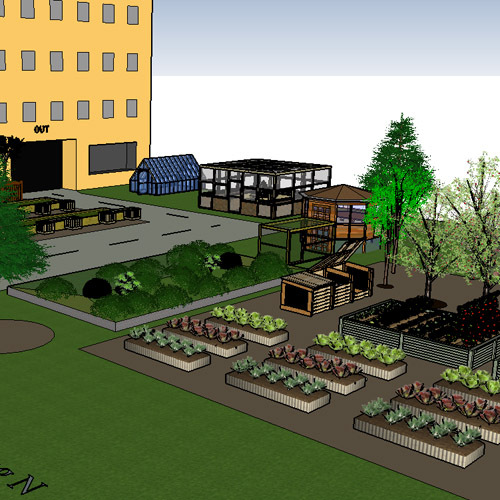 These include an urban farm, pollinator beds, a farm-to-table café, and an air filtration arbor. Through the use of 3-D graphics and conceptual models, we’ll explore the integration of environmental services into urban landscapes. Presentation material will be drawn from a Master’s project conducted with Forterra. Instructor Paul Kraegel, MEH, MSW, is an urban ecologist and research manager at UW. He has consulted for Forterra in community-building projects and serves as a board member for an inclusive, outdoor preschool. Your $5 at the door donation directly supports our Education Programs! Paul Kraegel, MEH, MSW, is an urban ecologist and research manager at UW.